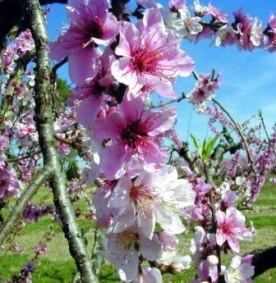 Peaches were later introduced into Europe and Columbus brought peach seeds to the new world on his second and third trips. These seeds eventually found their way to the red clay soil of middle Georgia where they were planted on acres of land which would later become Peach County. Fresh Georgia peaches are available only 16 weeks each year, from mid-May to August. 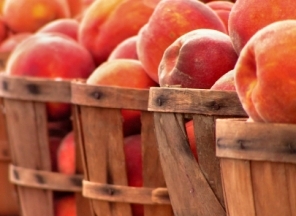 Although Georgia is still called the Peach State, it actually ranks third in United States peach production behind California and South Carolina, though Georgia peaches are arguably the sweetest and tastiest grown anywhere. At one point more than 50 packing sheds ran during peach season in Fort Valley and Peach County providing thousands of jobs for young and old alike. Now, two ultra modern facilities handle the peaches that once took so many sheds to pack. Peaches are generally available mid-May through mid-August. Both sheds offer tours during regular business hours. A typical Georgia peach crop can bring in up to 140 million pounds of peaches and brought and approx 30-40 million in revenue. About one half of the peaches harvested in Georgia come from Peach County. 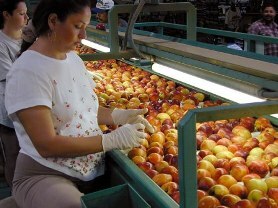 Georgia enjoys important production and marketing advantages, primarily its proximity to eastern markets and favorable prices because of early harvests and high-quality fruit production. Nearly all peaches grown in Georgia are sold in the wholesale fresh market, with a small percentage sold at roadside markets. There is no significant processing of peaches in Georgia. Big 6 Farm is comprised of 1,500 acres of peaches and 2,000 acres of pecans. This family farm produces a bounty of fruit and nuts with the finest being used in Mary Pearson's mail order business, Pearson Farms. Four generations of Pearsons have farmed the red clay of Peach and Crawford Counties, growing peaches, pecans, asparagus, timber, cotton, corn and other crops. Moses Winlock Pearson and his wife Cornelia moved to this area a little more than 100 years ago and planted the first peach trees for the Pearson family. There were six sons and six daughters. One son, Al Pearson's grandfather John, started farming on his own, adding more land to the family holdings and planting more peaches. Visit the Pearson Farm/Big 6 website for more information. Lane Southern Orchards formerly Lane Packing Co. 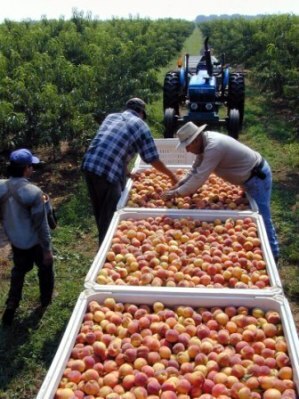 Founded in 1908 by John David Duke as Diamond Fruit Farm, Lane Southern Orchards farms more than 2,500 acres of peach trees and 2,000 acres of pecans. Located just outside of Fort Valley, the fourth generation family operation now grows more than 30 varieties of peaches. John David Duke built his first peach packing house in 1942. J.D, Duke Packing Co. was taken over by his son-in-law David O. Lane, and grandson, Duke Lane, Sr. in 1950 and the packing shed became known as Lane Packing Co. Following the retirement of his father, Duke Lane Sr. became sole owner and, until 1975, continued to pack peaches at the same location his grandfather built in 1942. In 1976, Duke Lane Sr. formed a partnership with the Russell Pearson family. Together they built a more modern packing house and named the company Pearson & Lane. This partnership remained in place until 1989. After the 1989 season, the Lane family began construction of a new packing house on the family farm. This facility is one of the most modern of its kind and was ready just in time for the 1990 crop. Visit the Lane Southern Orchards website for more information.